Solid-phase extraction (SPE) is a sample preparation method where the compounds that are dissolved or suspended in a liquid mixture are separated from other compounds depending on their physical and chemical properties. Solid-phase extraction is designed for rapid sample preparation and purification prior to chromatographic analysis. 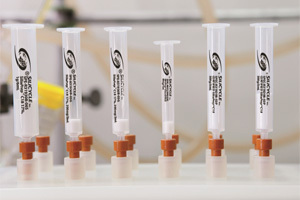 SPE is widely used in analytical laboratories for it is a crucial step in sample preparation. We know perfectly well that a cleaner sample yields better result. What is the use of sample preparation?